Squeak 4.2 final now out! Squeak4.2-10966.zip is now available at http://ftp.squeak.org/4.2. This is intended to be the actual-released 4.2 image, unless, as Chris Muller says, “we find some problem, which we won’t!”. Cleaned-up code base, with better support for unloading optional packages and fonts. The last of the underscore assignments have been replaced with ANSI assignments. Refactoring and unification of Smalltalk and SmalltalkImage globals. System Reporter (found under Help > About this system) – a tool to simplify and standardise the reporting of your image’s set-up. 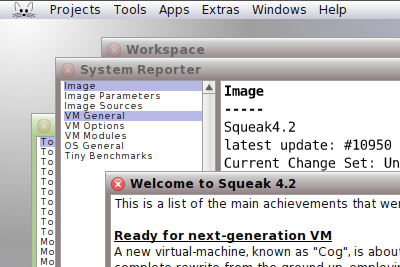 See Help > Welcome Workspaces > Welcome to Squeak 4.2 for more details of the changes in this image. Note that users on Macs may find that the mouse buttons work in an unexpected order in this image. This is expected behaviour to allow for the grand reunification of mouse button handling in the upcoming version of the VM, which will restore the standard behaviour. In the meantime, use the Swap Mouse Buttons preference to keep things sane. Congratulations to Chris Muller who has been leading the effort to get this release out the door, as well as the many contributors who provided updates, error checking, bug fixes and moral support for the process. Remember to update squeak.org site with new links to this version. wtf is this mess with the version number ? 4.2 but 4.1 or 4.4 ?? are you suferring some kind of innumeracy ? I have still problems with the OmniBrowser. The installation below works fine – but it requires also an installation of eCompletion. However, installing eCompletion via UniverseBrowser also fails. The problem with eCompletion seems to be solved just by changing the source of one method. Hi, I am loaded with 4.2 and I see the telemorphic, is that new? Is there a wiki or page to read from? Sorry Carlos, I don’t know. Telemorphic has been around in Squeak for ever, but it looks as though it received a bit of attention recently, so maybe it’s worth asking on the squeak-dev mailing list if you’re interested in finding out more.